Option: Green - 7'10" x 10'6"
We purchased a navy and a green rug. The navy has been in our sun-room not exposed to weather and has held up very well for the past two years. Last year we ordered the green one for our outdoor deck exposed to sun and rain. The green on the rug literally disintegrated. Before resealing our deck the rug dried out after we resealed our deck it now takes 2 days for the rug to dry out. Would recommend indoor use only for this lovely rug. Option: Aqua - 7'10" x 10'6"
Love this area rug. I placed it outdoor under my patio set. It has survived one of the worse snow seasons and still looks great! This rug was purchased for outdoor use under covered patio to go with gray furniture and navy curtains. Rug is soft enough underfoot. Beige is light colored so am not sure right now how it will wear over time. Pattern is not too busy. For the price it was a great find. I am happy with this purchase and will likely buy another one. Rug looks fabulous! Would recommend it. 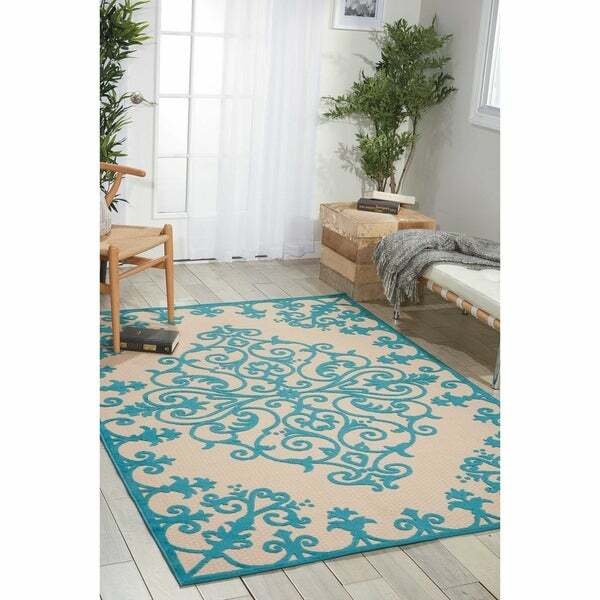 This is a beautiful rug, the teal color is vibrant and dimensional, truly stands out. Would absolutely recommend it to anyone who wants to add color and style to their room. Ordered the rug in orange and love it. Color is even better than it shows in picture. Very good quality. 100% satisfied and pleased with purchase. We live on Maui, in a rather cool, damp area. Our guest accommodations are in the basement, so I wanted a pretty rug, but not one that would retain moisture, or that cost a fortune. I ordered this in navy, and am delighted. I think it makes the (very small) guest room very attractive, and it feels good under bare feet. 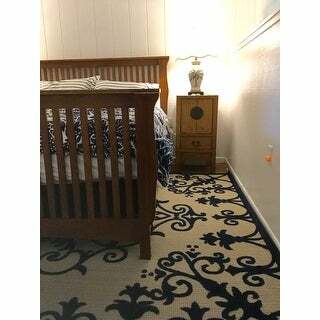 This rug is so pretty and it's durable enough to take on my 4 children! I highly recommend this beauty! Faded after one summer in the side where the sun hit it. I bought two of these rugs, my husband thought I was crazy, after having them on our patio now for a few months even he loves them! We have pavers on the patio and not only do the rugs look great they really save your feet! Just as expected. Perfect size for the gazebo. Bright color red and beautiful design. Match perfect with my backyard furniture. Will purchase again. A very pretty and big rug I think it will hold up very well. Beautiful. Looks good after our first rain. Buying a second one for the other patio to tie our outdoor space together. "What color is the base color? Is it more of a tan or off white?" "Is the red a true red or is it burgundy?" It's a true red. It's gorgeous! "Does this rug dry quickly after it gets rained on?" Yes, it will dry fairly quickly. Hello ballping, this rug can be spot cleaned or hosed off, if excessively dirty. You are welcome to machine wash this item, however it will need to be laid flat to dry. Thank you for shopping with us!